I love everything Christmas. Since arriving in Europe, the Christmas Markets have played a huge role in my winter festivities. I try to cram in as many as I possibly can. We have found them all to be different and worth exploring in their own right. 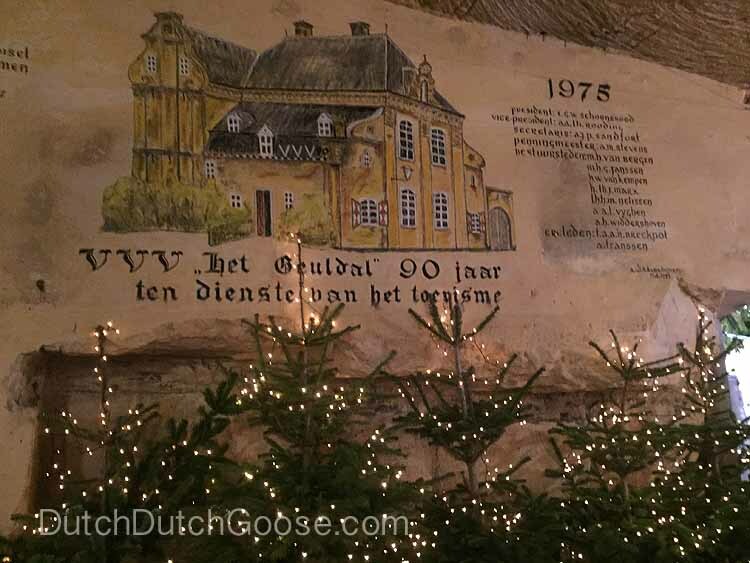 So despite many online mixed reviews, when we found ourselves fifteen minutes from the Christmas Markets of Valkenburg I knew we had to check them out. Valkenburg offers many different cave experiences. (Read about our previous, non-Christmas, visit here.) None though are quite as famous as the Christmas Markets held inside the caves. You have two options for your visit: the Municipal Caves and the Velvet Caves. Either cave will cost you €7 to enter. We ended up at the Municipal Caves, but I’m getting ahead of myself. On our last visit to Valkenburg parking was a mess. We figured with the markets we would save ourselves the trouble and park at the top of the hill near the Wilhelmina Tower. There is some available free parking here and since we arrived early there was hardly anyone else there. When we parked the snow had already started to fall. We figured we were in for a light dusting. The plan was to head to the Fairytale Forest for a bit and then down into the caves for a lunch. The Fairytale Forest has special Christmas festivities including ice skating that just look amazing. We were planning to meet friends, but they got a bit turned around and ended up being funneled into a parking lot in town. Since we knew our way around we skipped the forest and headed down into town to meet them. You can walk down the mountain but we opted to ride the chair lift. The staff was happy to put the stroller on its own chairlift. The Middle Little wasn’t happy about ridding the lift with Daddy in the snow, but I had already boarded when he expressed a preference for seat mates. This is the same lift we used in the fall in conjunction with the alpine slide. The view is quite a bit different in the snow though. It is just a few blocks walk from the chair lift to the markets. Everything is well marked in Valkenburg and they even put up temporary signs for the Christmas festivities. When we finally arrived at the Municipal Caves there was a huge line stretching down the street. We waited patiently as the wet now soaked us for about 20 min and then found ourselves at the ticket counter. At this point if you have purchased tickets online you can head into the cave. We however had to wait to purchase tickets – another 10 min or so. Luckily a security guard pulled the boys and I under an awning to wait while Jeff got the tickets. With tickets in hand you head into the caves to wait a bit more. There is a control point at the entrance and exit to the caves where they are controlling for volume. When you are waiting in the mouth of the cave there is no way to know how long it will take to get in. Sometimes the line moves quickly and sometimes it just stands there. At least we were warm and dry though. Past the control point the caves widen and you can wind your way through them and enjoy the lights and vendors. The decorations in the cave are just lovely. It is fun to see all the stuff you would see on a cave tour set against a Christmas backdrop. The children enjoyed all the Christmas scenes that are set throughout the cave. They have done a wonderful job of showcasing the paintings and such inside the cave along with original Christmas decorations. The part of the caves containing the market is quite wide. There is plenty of space for taking photos and pushing the stroller. The temperatures inside were comfortable, though we all kept our coats on. But for sure, it was warmer inside than out. I read a lot of complaints online about the selection of vendors. I did find this to be a place where the market is lacking. It felt more to me like our weekly regular market than a Christmas market, per se. There were bed linen vendors and even an electronic cigarette vendor when we were hoping for independent craftsmen. We did find a few cute stalls. The knock off “Delft Blue” ornaments and display were adorable and at a perfect price point for a quick gift. There were also some adorable Santa figures and Christmas Kabouters that were just charming. Other than that though we saw everything from hand cream to neck pillows to cheese. If you’re looking for quality, handmade goods, you won’t find a huge selection here. I was happy to have the Hippychick Hipseat with me. The Middle Little was a bit small to see most things. He is also not a big fan of crowds. I was able to carry him along on my hip with ease. Food options inside the cave area were quite limited. There is a small beer house serving drinks and light snacks. There is also a bakery with waffles and a few other sweet treats. We also found one vendor with sandwiches and soup. It was enough for us to get by on, but don’t plan on eating a full meal in the caves. I was a bit worried there wouldn’t be toilets, but there, of course, are. I do advise you to use them when you see them as we only ran into one on the path we took. We could have easily spent more time exploring the caves. There are several paths and we only followed one to the terminus. We felt that we had had enough though and exited the caves to find that the snow had continued to fall. We don’t get a lot of snow in the Netherlands, so the boys were overjoyed. We walked back through the main part of town and stopped in at a french fries stand to supplement our cave snacks. The snow was still really wet and although the ground was icy the biggest issue was the water gathering everywhere. We enjoyed a bit of time in the snow, thinking it would be our only chance this year. Valkenburg looked beautiful in the snow. The boys rubbed the fresh snow off of walls and made snowballs as we walked through town. The Little Little was so cozy and warm he kept sleeping even as we ran a few errands, picking up some bread and Limburg pies before we left town. We said goodbye to Limburg and boarded the chair lift back up to our car. We got on the road and quickly realized that the entire country was getting snow. The highways were at a crawl. Our usual 2 hour drive from the south of the Netherlands ended up taking us nearly 5 hours to make it home. We started seeing plows in the opposite direction and soon found ourselves behind a row of plows for a part of the drive. When we arrived home in Delft everything was snow covered and it was dark. Typically I would have gone to bed with the kids buzzing about a snow day…but the Dutch don’t do snow days. Monday morning, with the canals frozen on the top and snow still falling we took the boys to school. It was too icy to ride the bikes or drive so instead we went on foot. I spent a bit of time watching out our house windows (see I really am becoming Dutch) and noticed that every other family was bringing the kids to and from school in a sled. When afternoon pickup came around we loaded the team up and pulled them home from school in sleds. Although the snow created quite a bit of chaos it also made everything even more magical. I was so glad to have been able to see the Netherlands covered in this lovely white blanket. By Wednesday the rain set in and the snow was melted and replaced by patches of ice. Everything seemed to be back to business as usual.